The Scandretti-Person household now adheres to a strict regimen of mandatory adventures, held biweekly: on Thursdays, which are Betty’s day off, there is generally a long sleep-in followed by a drive, and on Saturdays, after Betty finishes teaching, there is a dance class in the city followed by some sort of urban hijinks. For example! 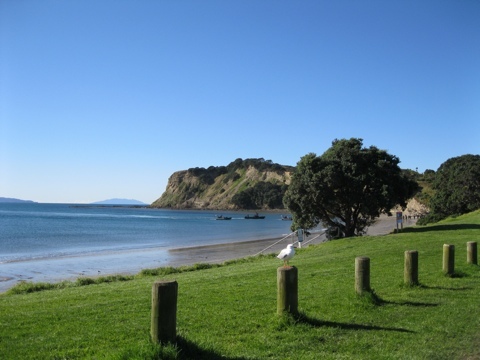 On a recent Thursday, the plan was to drive up to the beautiful Shakespear Regional Park. It turned out to be closed, but Betty and the husband person were still able to get to one of the small beaches just inside the park limits. It’s called Army Bay. Wanna know why? It was lovely fun: Betty and the HP watched a great many black-suited men manoeuvre their inflatable boats out to sea (which didn’t appear to be as easy as it looks – but points for effort) and then explored the beach in detail. There were more departed starfish than Betty had ever seen. There was a pizza. There was fresh salt air. On the way home, they stopped at a mall and husband person bought Betty a copy of Brigadoon (Gene and Cyd, seventeen-minute dance sequence, four dollars). An excellent adventure, indeed! 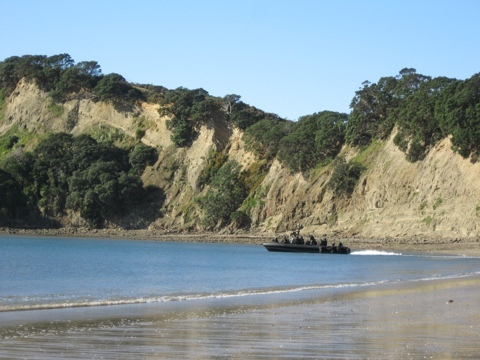 This entry was posted in Adventures, Auckland, Photos and tagged adventures, Army Bay, Whangaparoa.